Our set of 15 indoor floor cushions are large enough to play on or use as a seat at reading time. It is large enough to be used for either pre school or primary school children. The cushions are made with a fibre filled inner for comfort. 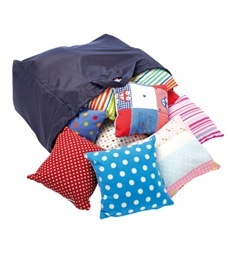 Only to be used indoors the cushions come in a random selection of fabrics and colours.